Eddies can influence biogeochemical cycles through a variety of mechanisms, including the excitation of vertical velocities and the horizontal advection of nutrients and ecosystems, both around the eddy periphery by rotational currents and by the trapping of fluid and subsequent transport by the eddy. In this study, we present an analysis of the influence of mesoscale ocean eddies on near-surface chlorophyll (CHL) estimated from satellite measurements of ocean color. The influences of horizontal advection, trapping, and upwelling/downwelling on CHL are analyzed in an eddy-centric frame of reference by collocating satellite observations to eddy interiors, as defined by their sea surface height signatures. The influence of mesoscale eddies on CHL varies regionally. In most boundary current regions, cyclonic eddies exhibit positive CHL anomalies and anticyclonic eddies contain negative CHL anomalies. In the interior of the South Indian Ocean, however, the opposite occurs. 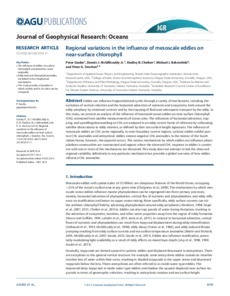 The various mechanisms by which eddies can influence phytoplankton communities are summarized and regions where the observed CHL response to eddies is consistent with one or more of the mechanisms are discussed. This study does not attempt to link the observed regional variability definitively to any particular mechanism but provides a global overview of how eddies influence CHL anomalies.